In honor of Halloween next week, I thought I'd dress up like one of the infamous, pastel-wearing, Channels from the TV-seriese Scream Queens. This costume idea came to me randomly while partaking in one of my favorite pastimes, online shopping. 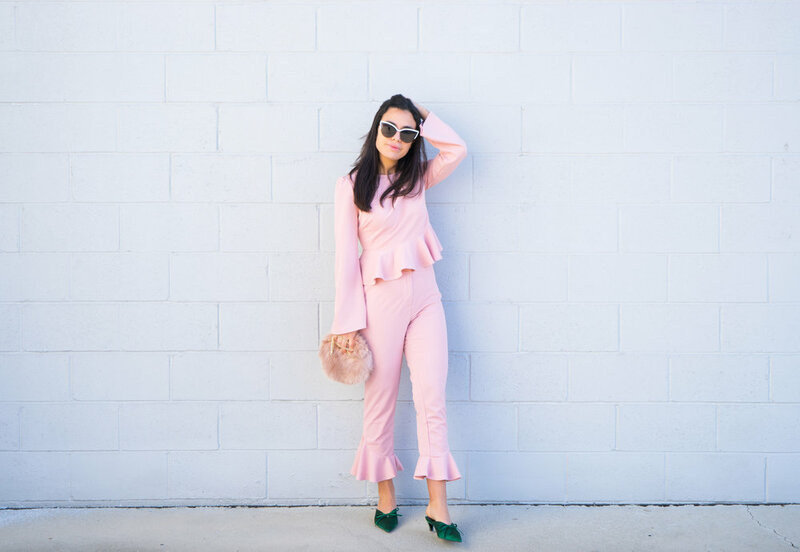 I saw this Peplum Top and Ruffle Hem Pant Set, at Shein, and immediately thought of all the girly, over the top, outfits that the Chanels wear in Scream Queens! The only difference is, you dong have to spend hundreds of dollars like the Chanels to get this look, instead all you need is $24! This-all pink outfit does most of the work -- I just added a touch of satin, fur, and statement sunglasses, to finish the look. In fact, if you're looking for a good group costume idea, check out this image of all four Chanels wearing light pink. I'm linking up some Chanel-worthy pieces at the end of this post to help you and your BFFs transform yourselves into the infamous Scream Queen clique!